Your lawn is the most prominent element of your home. As curb appeal goes, your lawn is king. A beautifully manicured lawn with vibrant, healthy turf can make even mediocre landscaping pop. Gateway Home & Garden Center carries a full line of turf care products to help you keep your home looking great from the outside. Not only do we have the products that will keep your lawn the envy of the neighborhood, but we can also help you plan the treatments, application, seeding and care. Our turf care program provides a step by step program to help deliver the best possible turf results. 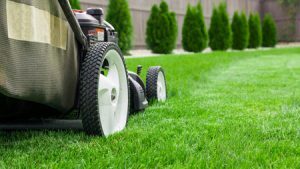 When grass is growing, you should be mowing regularly. In the northern Virginia area, growing season for grass is from about April through July and September through early November (maybe later depending on warm spells in November). During this time, there will be opportunities to treat your lawn too. Just be sure that you are providing the right amounts of water and careful to only mow when appropriate after treating your lawn. Before mowing, be sure to rake up any places where old clippings have matted down. When you mow, you don’t need to bag, though it’s fine if you do. If you are using a mulching mower, the grass clippings are cut into much smaller pieces and left on the lawn. As the clippings break down it can add nutrients and help you’re lawn become more beautiful. During the hot season – usually late July and August – lawns in northern Virginia may often go dormant. It’s okay to not mow during this time and you should leave it a bit longer if possible, as it will help protect the roots during dry weather. 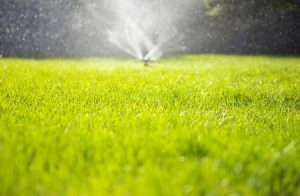 As soon as the weather breaks at the end of the summer and a bit of rain comes your lawn will spring back to life. The amount and type of fertilizer and treatments you provide for your lawn depends a lot on how rich and fertile the soil is in which your turf grows. In the Spring and Fall, during planting season for grass, is a good time to add soil amendments and over seed to produce the best outcome. Gateway Home & Garden Center has everything you need to take care of your lawn and make it as beautiful as it can be. Come by and talk to our staff about what’s right for your yard.